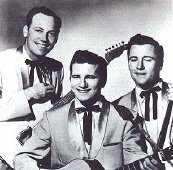 With lead guitarist Paul Burlison, and brother Dorsey, Johnny Burnette founded the pioneering, but largely overlooked rockabilly group the Johnny Burnette Rock 'n' Roll Trio in the early 50s. although they never enjoyed national acclaim, the group produced some of the wildest rockabilly of the era. Paul Burlison was born February 4, 1929. At age ten he was inspired and taught by a black man a finger picking down home style of blues. Each day Burlison would wait from this man, whose name he never knew to pass home from work. After his discharge from the Navy, Burlison played with Clyde Leoppard and the Snearly Ranch Boys and was on the radio in 1949 with Don Paul. He met the Burnettes about 1949 through their mutual interest in boxing. That year he would join the Shelby Follin Band, and for a few months he and bandmate Smokey Joe Baugh performed with Howlin' Wolf on radio KWEM in West Memphis, Arkansas. Burlinson played with Follin until 1954. Johnny Burnette and his brother, Dorsey were from Memphis and loved boxing almost as much as they loved singing. When they were unable to make a living from boxing they formed a trio with Paul Burlison while still in high school. In 1952 all three worked as electricians for the Crown Electric Company, which later hired a truck driver named Elvis Presley. Officially formed in 1953, the trio auditioned for Sam Phillips's Sun Records following the local success of Presley's "That's All Right". Although they weren't signed, they persevered. Hard work led them to the Hideway Club in Middleton, Tennessee where they became regulars.They played there with Doc (Junius P.) McQueen band from 1954 to February 1956. Their first record, "You're Undecided" was a country song on the Von label from Bonneville, MS, almost a year before the first Elvis single. In late 1955, they invited to appear on the Ted Mack Amateur Hour television competition where they won the competition three times in a row. Their wins brought them to the attention of big band leader Henry Jerome, who became their manager and brought them offers from five companies. They soon signed with Coral Records and recorded their first single "Tear It Up" in New York City in May 1956. The record became a hit in Boston and Baltimore, but failed to make the national charts. The group began to tour nationally as part of the Ted Mack package show and finished its first album in Nashville at the Barn under producer Owen Bradley. In July they returned to the studio in July and recorded "The Train Kept-A-Rollin". They also toured with Carl Perkins and Gene Vincent and appeared in the film Rock, Rock, Rock. In March 1957 the group went into the studio for its third and final time. Dorsey Burnette soon left to be replaced by Bill Black's brother Johnny. The Rock 'n' Roll Trio officially disbanded in the fall of 1957. In 1958, the Burnettes moved to California where they concentrated on songwriting and recording demo records. They supplied Ricky Nelson with two of his most boisterous hits "Waitin' in School" and "Believe What You Say." Dorsey also supplied Nelson with "It's Late" while Johnny furnished "Just a Little to Much." Johnny recorded for Freedom and Liberty Records, while Dorsey recorded for Era and later Dot. In 1960 Dorsey had hits with "Tall Oak Tree" and "Hey There Little One" on Era, while Johnny had a hit with "Little Boy Sad," "Big Big World," and "God, Country and My Baby," but on August 1, 1964 died in a boating accident on Clear Lake in California. In the 60s Dorsey switched to country music and had a number of moderate hits between 1972 and his August 19, 1979, death of a heart attack in Canoga Park, California. Burlison stayed in retirement until the 70s while continuing his contracting business, tending his horse farm, and running a mail-order record business. In 1980 he returned to recording with a tribute record Johnny Burnette's Rock and Roll Trio and Their Rockin' Friends from Memphis. A few years later he joined the Sun Rhythm Section.